Now We Have a Compact, But What the Heck Do We Do with It? Last October, I wrote about the process some healthcare organizations are engaging in to develop written compacts between physicians and the hospitals where they practice. The point of my post was that there are inevitably some generally accepted (but rarely articulated) expectations that the two parties have of each other, and it can be valuable to make these expectations explicit in a written document that everyone can agree to – especially in this environment of rapid change in the healthcare landscape. Earlier this month, Dr. Dean Gushee happened upon that older blog post and commented, “What I cannot seem to find explicitly, is what organizations actually ‘use’ the compact for.” It’s a great observation, and I’m guessing in all too many cases the compact simply goes in a frame on the wall or in some binder on the shelf, and rarely enters the conversation again. But Dr. Gushee’s query got me to thinking about all the possible ways one could gain beneficial use of one of these compacts. At its core, a compact is intended to ensure a common understanding among its parties about the guiding principles of their relationship. I believe that there is incredible value just in the process of two parties sitting down and engaging with each other to discuss the issues underlying their differences and to negotiate the agreement in the first place, even if the compact never got used for anything else. Once it is in place, its best and highest use – in theory, at least – would be to guide the ongoing relationship and interactions of the hospital and doctors with each other and to foster mutual understanding and mutual respect, with the goals of minimizing the risk of serious conflicts and helping the parties navigate the inevitable ones. But there are other, more practical uses for a compact that I’d like to suggest hospital medicine groups consider. When your group engages in periodic strategic planning, consider building compact language into your group’s mission, vision, and values statements. Spend a meaningful amount of time reviewing the compact and discussing its implications for your group’s goals and priorities. Consider framing your plan in terms that organizational leaders would be more likely to support, because they are based on compact principles. Incorporate the compact principles into your job description and recruitment process, to help ensure that you hire clinicians who understand and are fully supportive of the commitments the organization and its doctors have made with each other. You can also incorporate the compact into your new hire orientation as a way of reinforcing expectations for new clinicians as they are onboarded. Even though most compacts I’ve seen in healthcare are between a hospital (or health system) and its physicians, lots of HMGs have used compacts as a framework for negotiating co-management agreements or other relationship with the various specialty consultant groups they work with. Consider developing a physician group-to-physician group compact that covers things like what diagnoses or DRGs will be co-covered, who will serve as attending vs. consultant, response times (and by who), responsibilities for note-writing, and discharge responsibilities. I believe your compact should come in handy when you are negotiating with your organization’s leadership about things like how your group’s clinical scope or footprint should evolve, or what additional resources you need. It’s definitely worth framing your arguments in the context of the written expectations that have already been established by both sides. For example, if you need Administration’s support to ensure you don’t get “dumped on” by the general surgeons, you might remind them about their commitments to support career development and professional satisfaction or to foster an environment of mutual respect. Last – but not least – we get to the idea of incorporating compacts into performance evaluations. Gushee wanted to know exactly how organizations go about doing this. Though I haven’t personally seen examples where this is done, I have some ideas. You could incorporate selected (very specific) compact terms into a formal performance evaluation tool used by leaders to evaluate staff. Or you could design a peer or 360-degree evaluation tool that asks respondents to rate a clinician on – among other things – how well she lives up to the compact commitments in her everyday work. Perhaps one of the best ways to use compacts in performance evaluation might be for your group to annually undertake an assessment in which group members collectively rate the group as a whole regarding how well it lives up to the compact’s physician commitments, and also rate the organization on how well it is living up to its commitments. At the same time, offer the same tool to hospital or health system leaders and ask them to assess both your hospitalist group and themselves on the same metrics. 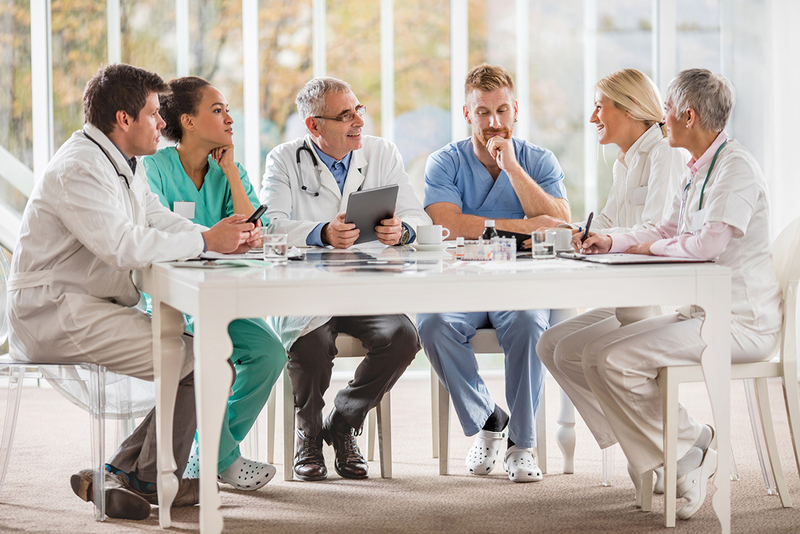 Then schedule a meeting for hospital and hospitalist group leaders to sit down and review the two assessments side by side with the goal of understanding each other’s perspectives and identifying some ways in which both sides could work to improve their performance under the compact. Regardless of how you decide to use your compact (or compacts), the single most important thing you can do is to ensure the compact has a champion. A compact truly lives only when a leader or champion constantly reinforces it and makes it “real” for the members of the group by incorporating it into the group’s mindset, language, and ways of doing things. I’m sure this list is not exhaustive. But I hope I’ve given you some ideas about how you might take that dusty old hospital-physician compact off the shelf and breathe some new life into it. If you or your group have used a compact (either hospital-physician or physician-physician) in a creative or helpful way, I’d love to hear about it.